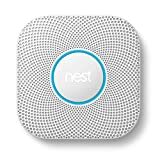 Smoke detectors save lives, but they're also the single most annoying and obnoxious items in your home when there's not an actual fire or carbon monoxide leak. Well, the days of fearing to make toast or basically anything in the kitchen or even outside on the grill (seriously, happens to me all the time), trying to fall asleep with a low-battery chirp alert happening somewhere, wondering if your house is burning down while away, and snapping towels and flailing your arms around trying to shut the idiotic thing up are over. The smoke alarm has finally been reinvented. 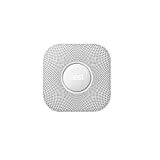 The cool new Nest Protect is a state-of-the-art smoke and carbon monoxide detector that is not only smart, it isn't annoying. 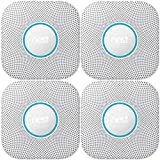 When its innovative photoelectric smoke, CO, heat, light, ultrasonic, and activity sensors detect rising levels of danger that are not yet emergencies, it actually speaks to you with a friendly heads up warning first instead of blaring an ear-piercing alarm, which can easily be dismissed with a simple wave of your hand. When there is an actual emergency, it flashes red lights, sounds the alarm, and verbally announces the problem and in which room. When you flip off the lights at night, it shows its current status with a quick flash of a green glowing ring and has handy integrated LED lights that help to illuminate your path in the dark as you walk by. 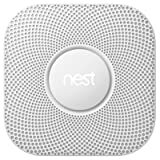 On top of all that, it even connects with an app on your iPhone to send out emergency alerts and low-battery warnings no matter where you are and integrates seamlessly with the equally cool Nest Thermostat. Check out this video to see it in action. So cool, as far as smoke detectors go.